The Knicks host the Hornets tonight, and it's the second of the five games on their current homestand. Want tickets? Good luck. Hell, even for Knicks road games scheduled more than a month from now, there's already little from which to choose. There are always tickets to be had on the online resale market, though. 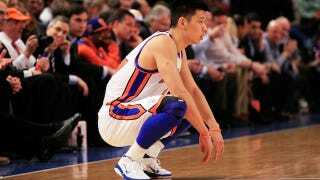 But how much is Jeremy Lin affecting ticket prices for Knicks games in New York? And how does his impact compare to the effect other stars have had on ticket prices on the secondary market after their arrival? SeatGeek's data also indicates that the price increase is even more pronounced as tipoff approaches. The price for Wednesday's win over the Kings rose $100 after Lin hit that gamewinner against Toronto on Tuesday. The average ticket price sold through SeatGeek for Wednesday's game was $317. A day earlier, the average price was $202. And a week before Wednesday's game was played, the average price was just $92. Flaherty said the increase was similar for tonight's game against New Orleans: From $91 on Feb. 10 to $187 on Tuesday to $274 on Wednesday to $306 today. To gauge Lin's impact compared to that of other stars, Flaherty examined what happened to prices after the Tim Tebow phenomenon took off in Denver last fall. He did so by comparing the prices of the Broncos' final five home games both before and after their overtime win against the Dolphins on Oct. 23. Before the Miami game, tickets were going for an average price of $149. Afterward, they jumped to $171. "So the 'Tebow Effect' on Broncos ticket prices effectively raised average prices by $20, or 14.4 percent," Flaherty said. As a local comparison, Flaherty also studied how Knicks ticket prices were impacted by Carmelo Anthony's arrival last year. The Anthony trade was completed on Feb. 21, and in the 15 days before it happened, the average price for a Knicks ticket was $138. For the 15 days after the deal, the price was $193. All told, it was an increase of 40 percent. "Neither of examples are close to what we're seeing with Lin where ticket prices are double, or even triple what they were before he broke onto the scene," Flaherty said.